I find it amazing how some people will waste their entire lives with another based on how they look, how much money they have, and/or status. It’s not just wealthy, unattractive men looking for hot young females who are to blame. 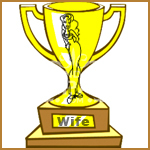 There are plenty of women who strive to be a “trophy wife” to some incompatible, half-man, dork because of how much money he has, the car he drives, or the house he lives in. It doesn’t make sense how either person can gamble on the future based on such objective, volatile traits. On one hand, you have a man willing to marry a women solely based on looks and age, offering nothing to the relationship, but making him look good in photos at company parties. On the other hand you have a woman willing to marry a man because he can provide a nice house, a nice car, and allow her to go on a few vacations a year with her girlfriends. Both scenarios offer superficiality in exchange for eternity (or however long the marriage lasts). Both scenarios are examples of unbalanced relationships, meaning either side will always think they are offering more, since what is offered on both sides is irrelevant to anything of substance and can depreciate over time. Both scenarios try to achieve happiness by way of objectifying and materializing life. Both scenarios will undoubtedly lead to regret and despair later in life. Trophies are kept in glass cases, polished and polished only when others are around. The same will be done to a woman who is viewed as a “Trophy Wife.” Every so often, the man will bring this woman out to events and gatherings and return her to the glass case at the end of the night. Attention will only be paid to this woman when it is time to come out of the glass case to attend future events and gatherings. This will repeat itself until the man no longer views the woman as a trophy. She is then set aside until a newer trophy is obtained or she is replaced by another gimmick to impress the people around him. If the attractiveness of both the man and women are not equal (meaning the total package: looks, personality, charm, etc. ), the relationship will never work or if it does last, either/both parties are unfaithful. When one views someone as a trophy, or one views themselves as a trophy, it is easy to justify in both thought processes that the hand they present is greater, allowing for an easy path toward infidelity. If you think you own the trophy, you do what you want. If you think you are the trophy, you do what you want. The term “wife” should already hold some sort of genuine adoration. Referring to someone as a “trophy” diminishes their human value. Trophies are taken, earned or won. Relationships are neither of these things. Relationships, especially marriages, are equal partnerships to a greater goal. It is acceptable to admire your significant other, but never should that admiration adhere only to diminishing traits; beauty, materials, etc. Instead of looking for a trophy in someone, we should look to win a trophy with someone.